The Molecular Genetics team supervised by Dr. Radha Venkatesan is committed to unraveling the genetics of diabetes, its complications, cardiovascular diseases and obesity. The department founded on 17th Dec 1999 carries out research on Molecular and Functional genomics supported by funding agencies like the ICMR, DBT and DST. It has published many papers in peer reviewed journals like Human Genetics, J Clin Endocrine and Metabolism, Diabetic Medicine, Diabetes Care, Metabolism Clinical and Experimental, Eye, American Journal of Cardiology, Diabetes etc. To find genes that cause/ predispose individuals to diabetes using genetic techniques and to understand the molecular basis of diabetes and its related traits in order to form a rational platform for improved diagnosis treatment of patients. To contribute to the discovery, identification and characterization of the genes and their variability involved in monogenic and polygenic forms of Type 2 Diabetes (T2D) and their intermediary phenotypes. The Advanced centre aims to improve the quality and multidisciplinary nature of diabetes research by providing shared access to specialized technical resources and expertise in relation to genomics of diabetes and diabetic eye complications. The Advanced centre will train scientific personnel leading to capacity building and development of basic infrastructure for carrying out genomic research related to diabetes and its complications. The overall goal of Advanced Centre is to bring together clinical and basic science investigators, from relevant disciplines, in a manner that will enhance and extend the effectiveness of research related to the genomics of diabetes and its complications. 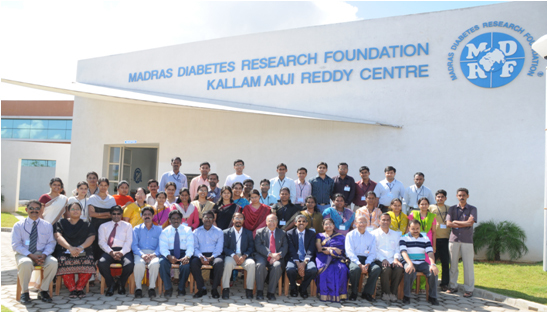 Thus the MDRF will serve as a Nodal Centre for genomic research related to Type 2 diabetes in India. The major research goals of the Advanced Centre for Genomics in Type 2 Diabetes Mellitus are to look at two aspects of the β-cell function namely; gene defects and the mechanism of their action. Significance of the Project: State-of-the-art technology and expertise in the field of genomics will be established. This will help in finding a genetic determinant/marker with the capacity of disease predictability in MODY and disease susceptibility in type 2 diabetes. The training and capacity building of young investigators from across the country in genomic techniques will help them plan and carry out research in the genomics of diabetes and other Mendelian and complex disorders. Hands-on “Workshop on the techniques in genomics in relation to diabetes and its related disorders” from 3rd– 9th January, 2009 at the MDRF, Siruseri. The hands-on workshop was aimed at training and capacity building of researchers in the country in advanced techniques in genomics. A memorandum of understanding was signed between chariman Dr. Mohan's DSC and clinicians from different parts of the country for the transfer of blood for screening for MODY and neonatal gene mutations. This is currently being followed-up actively. This is the first step by which the MDRF will act as Nodal Centre for screening for MODY and neonatal gene mutations. The candidate gene approach is used in studying disease and intermediary traits. We have found that PPAR gamma gene 12 Ala polymorphism does not protect the Indians from diabetes; however, we have for the first time shown that the coactivator of PPAR gamma, the PGC 1 alpha Thr 394Thr silent polymorphism to be associated with type 2 diabetes. Recently, we have replicated the rs12255372(G/T) and rs 7903146(C/T) of the TCF7L2 gene polymorphisms association to type 2 diabetes in the South Indian population. Another interesting outcome of our work has been that we were able to show a novel association of an intronic polymorphism in the adiponectin gene to type 2 diabetes, obesity and adiponectin level. Further, we have identified a novel MODY 3 gene mutation which we have shown to co-segregate with the disease in the family and which is not seen in normal glucose tolerant subjects. Additionally we have been able to show the Ala 98Val polymorphism of the MODY 3 gene to be associated with younger age at onset of the disease. Our work has resulted in 15 original publications in peer reviewed journals. We are currently performing replication studies on the recently identified type 2 diabetes. From SNP association the department is now focussing on genome wide scanning and large genome wide association studies for disease gene identification. In order to validate our gene association, we have established functional genomics lab where molecular characterization of novel and significant genetic determinants will be performed. The molecular genetics department is now working on deducing the functional significance of our novel and significant findings. Further focus is on finding novel genes that are responsible for causing type 2 diabetes mellitus, obesity and cardiovascular diseases using high throughput technology platform such as Illumina microarray. To offer diagnostic molecular genetic testing in order to improve the management of monogenic forms of diabetes, which are often under-diagnosed. On account of the department’s state-of-the-art facilities and know-how it has the ability to act as a nodal centre for training people from across the nation. Facilities to conduct large scale genetic studies like the genetic screening of MODY and neonatal diabetes in India. Primarily this project will help in detection of the MODY subtypes in a clinical set-up which will help in the treatment modalities for the MODY and neonatal patients. Additionally it will also help in understanding the molecular etiology of these subtypes of diabetes in India and help clinicians to offer the correct treatment to the patients.